How effective is remote care in this most crucial of units? A recent study produced interesting results while a Massachusetts children’s hospital reports early success with its pediatric program. Concerned about the labored breathing of a young surgical patient whose breathing tube had recently been removed, the Fellow manning the overnight shift in Boston’s MassGeneral Hospital for Children’s pediatric ICU (PICU) placed a call to Phoebe Yager, MD, the attending physician on call. But it wasn’t just any call. It was a video-enabled “home-to-hospital” call that allowed Yager to assess the patient in conjunction with the unit team, establish that his breathing was actually improved compared with earlier in the day, and even reassure the boy’s mother that he was indeed improving—all without losing valuable time commuting to assess the situation in person. Deployed in 2009, MassGen’s Connected Pediatric Critical Care program marked a significant enhancement of the system’s telemedicine program that had been in place for more than a decade. The original inititiative started as a telephone link that allowed specialists at MassGen to consult with attending physicians at two affiliated community hospitals to stabilize patients in the critical care unit prior to transferring them to the main hospital. In 1998, video capabilities were added to the program, allowing physicians to act as “another set of eyes to monitor the patient,” says Natan Noviski, MD, the MassGen’s chief of pediatric critical care medicine. Soon thereafter, the health system became the first to cross state lines when it established a video-based telemedicine program with a hospital in Puerto Rico. The Connected Pediatric Critical Care program goes a step further, providing a video link between the clinical staff in the PICU and the attending physician at home. In the unit, the video system is attached to a robot that can be rolled from bedside to bedside. The attending physician can be at the bedside, albeit virtually, examining the patient and communicating directly with the multidisciplinary team. The attending physician is able to control the robot from home, including zooming in or out and even viewing monitors. Special cameras and scopes can also be attached to the robot to allow for even closer examinations. Yager cites the case of a young girl who was admitted during the night with breathing difficulties. Via video linkup, Yager was able to determine that the patient was in pending respiratory failure and then guided the on-site team through insertion of a breathing tube before heading to the hospital. Though it’s too early for measurable outcomes from MassGen’s PICU telemedicine program, anecdotal results indicate communications are significantly improved. To that end, Noviski and his team are designing a long-term, large-scale study to evaluate any gains or improvements resulting from the telemedicine program. Once complete, the findings will be a welcome addition to a fairly limited pool of scientific research surrounding the efficacy of telemedicine in an ICU setting. Most recently, research from the University of Texas Health Science Center at Houston (UT Health) published findings from a study that measured the impact of remote patient monitoring in ICUs on patient outcomes. Researchers analyzed the records of more than 2,000 patients before the implementation of an ICU telemedicine program by a major U.S. health system and the records of more than 2,100 patients after implementation. The study, “Association of Telemedicine for Remote Monitoring of Intensive Care Patients with Mortality, Complications and Length of Stay,” involved six ICUs in five hospitals. It appeared in the December 2009 issue of The Journal of the American Medical Association and was supported by the Agency for Healthcare Research and Quality, the National Center for Research Resources, and the Center for Clinical and Translational Sciences at UT Health. Researchers found no significant overall changes in death rates, the frequency of eight complications, or patients’ ability to leave the ICU earlier. They did find that survival rates for the extremely ill improved in all the ICUs studied. These findings ran counter to the results of a 2004 study in which death rates and average lengths of stay declined in two adult ICUs in a large tertiary care facility after the implementation of a telemedicine program. The studied system consisted of a remote office located in the health system’s administrative offices, separate from all the hospitals. It was equipped with audiovisual monitoring equipment and was staffed by two intensivists, each working with two nurses and one technician to monitor ICU beds. Computer workstations provided real-time vital signs with graphic trends, audiovisual connections to patients’ rooms, early-warning signals regarding abnormalities in a patient’s status, and access to imaging studies and medication administration records. • integration of the telemedicine program and monitored units’ information systems. For example, in the study, most of the physicians who cared for patients in the monitored units retained control of decisions affecting their patients but did give the remote monitors authority to intervene in life-threatening situations. Progress notes were faxed from monitored units to the telemedicine program, while telemedicine orders were entered into the computer workstations and printed in the monitored units. Thomas points out that telemedicine may not be the best approach to resolving specific issues within a given ICU, particularly when the technology’s cost is taken into consideration. For example, he says studies have shown that utilizing checklists has been shown to prevent catheter-related infections and ventilator-related pneumonia—a far less costly solution than implementing telemedicine. There are no proven processes for determining when and if telemedicine is the best bet for a particular hospital or ICU. Rather, Thomas recommends facilities consider the unit patients’ severity of illness as well as the quality of care provided in the unit. Despite the Texas study’s finding that telemedicine did not have a significant impact on outcomes, expectations are that the concept will continue to grow in popularity. In fact, some believe the study’s findings demonstrate the true worth of telemedicine. “The real value of telehealth is that the outcomes were the same but the hospitals were able to use their resources more efficiently and possibly keep their ICU open with full physician coverage. I wonder how many of these facilities would have to consider closing their ICU if it were not for their teleICU program,” says Christina Thielst, FACHE, executive director of the Northwest Regional Telehealth Resource Center, a consortium of 33 experienced telehealth networks in Alaska, Hawaii, Idaho, Montana, Oregon, Utah, Washington, Wyoming, and U.S.-affiliated Pacific islands that serves as an information agent and shares resources to develop new programs. 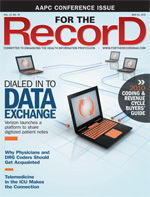 “Another important factor to look at is the impact of a telehealth program on the nursing staff. Are nurses in ICUs less frustrated and stressed, more effective, more productive in hospitals where they have access to a physician using telehealth? For some administrators, this could be a real return on their investment,” she adds. In fact, for many facilities, more efficient use of resources is a primary consideration for deploying telemedicine programs. According to the Society of Critical Care Medicine, 10% to 20% of all hospital beds are dedicated to critical care and account for 30% of overall acute care hospital costs. An aging population and increasingly complex illnesses, coupled with a worsening shortage of critical care physicians and nurses, is expected to drive those costs even higher while simultaneously making it more difficult to keep ICUs staffed at appropriate levels. Thielst points to several examples of how Northwest Regional Telehealth Resource Center members are utilizing technology to combat specialist shortages, including using telehealth for retinopathy-of-prematurity examinations of neonatal ICU babies and emergent pediatric consults with pediatric intensivists. Nevertheless, barriers remain that prevent telemedicine from achieving its full potential. These include reimbursement, cross-state licensing, and privileging.